FULL SUN Varieties that can be grown in full sun. SEMI-SHADE Varieties requiring semi-shade, no direct sun before 12pm on a winter's day (when flowering). SHADE Varieties that can be grown in shade, but need some sun in summer to form buds. MORNING SUN Varieties able to withstand morning sun in winter. POTS Varieties suitable for growing in pots. COASTAL Varieties whose blooms are sun hardy in coastal areas. NOTE: Just run your mouse over any term to read what it means. SEMI-Double. Rich pink with a silvery glow. Strong grower with wandering laterals - ideal for espalier. Relatively large blooms (to 10cm) and foliage. Early April to mid-July. Large INFORMAL DOUBLE. Burgundy. Medium upright growth, excellent for espalier or small specimen tree. Early March to mid-July. SEMI-DOUBLE. Deep lavender pink. Fast upright growth. Excellent for hedging or specimen. Flowers late February to early June. Small SEMI-DOUBLE (6cm). Bright pink. Low grower with rich dark green foliage. Outstanding dwarf Sasanqua. Mid-April to July. Large FORMAL DOUBLE. As flower ages blooms will show stamens. Pearly white. Medium growth with pendulous laterals. Suitable for specimen, hedge or espalier. Mid-March to end of July. Large SINGLE. Soft pink with silvery overtones. Fast upright growth. Excellent for hedges or specimen. Mid-March to early June. Large SEMI-DOUBLE. Deep pink. Pendulous growth, suitable for specimen or espalier. Flowers do not shatter easily. Long flowering. Early April to mid-September. SINGLE. Bright pink to deep rosy red. Fast upright growth. Excellent for hedge or specimen. Mid-March to early June. INFORMAL DOUBLE. Clear pink. Fast, upright growth. Excellent as specimen or for hedge. Mid-March to mid-June. SEMI-DOUBLE with loose cushion of matching petaloids above central stamens. Bright rose pink with silvery sheen. Blooms last longer than most. Medium upright growth. Suitable for specimen, espalier or medium hedge. Flowers mid-March to mid-June. Large SEMI-DOUBLE (8cm). Mid pink. Prostrate growth. Ideal for groundcover or rockeries. Mid-March to late June. Many petalled SEMI-DOUBLE. Creamy white. Slow to medium growth, spreading in habit. Ideal for a low hedge. Early April to mid-June. INFORMAL DOUBLE (7cm). Dainty pale pink with inner petals incurving. Slow growth. Mid-March to late June. Large saucer-shaped SINGLE. Soft pink. Fast upright growth with pendulous laterals. Excellent for hedge or espalier. 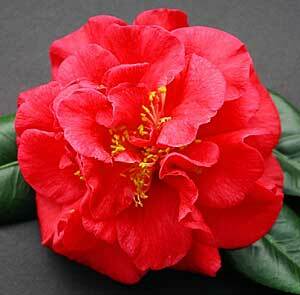 Camellia Grove seedling. Medium INFORMAL DOUBLE. Buds are pink and open pure white shading to pink edges. Fast upright growth with pendulous laterals. Suitable for hedge, specimen or espalier. Mid-March to end of June. Large and beautiful SINGLE with petals waved and fluted. White. Fast, upright growth. Good for hedge or specimen. Flowering March to mid-June. SEMI-DOUBLE. Bright rose. Slow yet sprawling grower, easily trained to bushy shrub, for low hedge, or to sprawl down over rock or wall, espalier.Mid-March to mid-July. Medium INFORMAL DOUBLE (6cm). White. Slow upright growth. Idead for low hedges. Mid-March to late-June. INFORMAL DOUBLE. Bright pink to deep rose red. Fast growth, pendulous in habit. Suitablefor hedge or espalier. Flowers early March to early June. Large SEMI-DOUBLE (8cm). White, blooms can have a pink flush particularly late season. Prostrate growth. Ideal for groundcover or rockeries. Mid March to late June. Medium INFORMAL DOUBLE. Creamy white blooms. Fast upright growth. Excellent as specimen or for hedge. Mid-March to mid-June. Small SINGLE. Glowing red with prominent yellow stamens. Slow, dense, upright growth. Mid-March to mid-July.